SUNCROWN is a multi-national symphonic/epic metal band formed in 2011 by songwriter and keyboardist Oleg Biblyi (Ukraine) and vocalist Darren Crisp (USA). Then guitarist Gustavo Bonfá (Brazil) and bassist Ederson Prado (Brazil) joined the band. 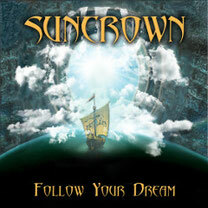 In 2011 SUNCROWN released two video clips, the first one is “Follow Your Dream” in July and an another one is "Children Of The Sea" which is Black Sabbath cover with legendary drummer Vinny Appice (Dio, Black Sabbath and Heaven & Hell) in October in memory of Ronnie James Dio. 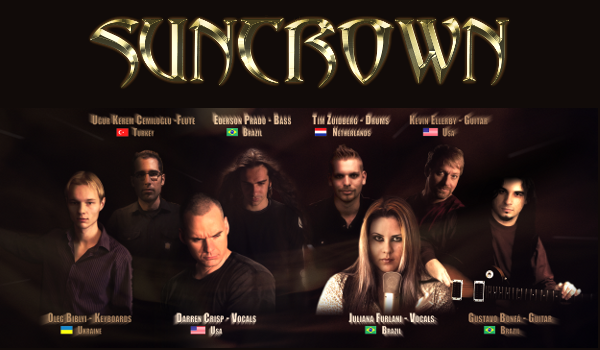 Female singer Juliana Furlani (Brazil) and drummer Tim Zuidberg (Netherlands) has joined and bring great performance and energy to the group. In February 2012 the band recorded a video clip “Believe” with 2 new members: guitarist Kevin Ellerby (USA) and flute player Uğur Kerem Cemiloğlu (Turkey), and in June the group released a new video on song “Eyes of the World” which showed the essence of the full group. As you can see in videos from the band, their music is for a fan of KAMELOT, Nightwish, Serenity, Sonata Arctica, Xandria. Their first album entitled “Follow Your Dream” was released in November 2012. It is now available on SUNCROWN website. Currently the band is working on the second album "You Are Not Alone" with new guitarist Sindre Myskja (Norway). A couple days ago, a new video for "The Beginning Is Near" (Below) from upcoming album, was posted.